A great introduction for retail students, this book offers a user-friendly reference guide to all aspects of visual merchandising and covers both window dressing and in-store areas. Using examples from a range of shops, from fashion emporia to small outlets, the book offers practical advice on the subject, supported by hints and tips from established visual merchandisers. It reveals the secrets of their toolkit and information on the use of mannequins, the latest technology, and how to construct and source props, and explains the psychology behind shopping and buyer behavior. 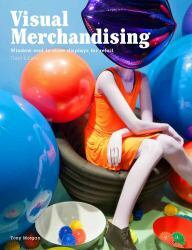 This new edition contains two new case studies, updated images, and new material on digital and interactive visual merchandising. Presented through color photographs, diagrams of floor layouts, and store case studies, and including invaluable information such as a glossary of terms used in the industry, Visual Merchandising is an essential handbook for anyone working in and learning about this exciting area.